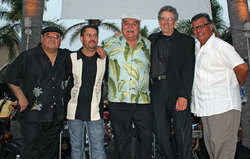 The Nuestro Band has been entertaining audiences throughout Southern California for over 20 years and Nuestro's unique musical style delights young and old alike. The Nuestro Band has your musical taste covered. "La Coleccion" & "Sitting In The Park"
please click on the contact "The Nuestro Band"